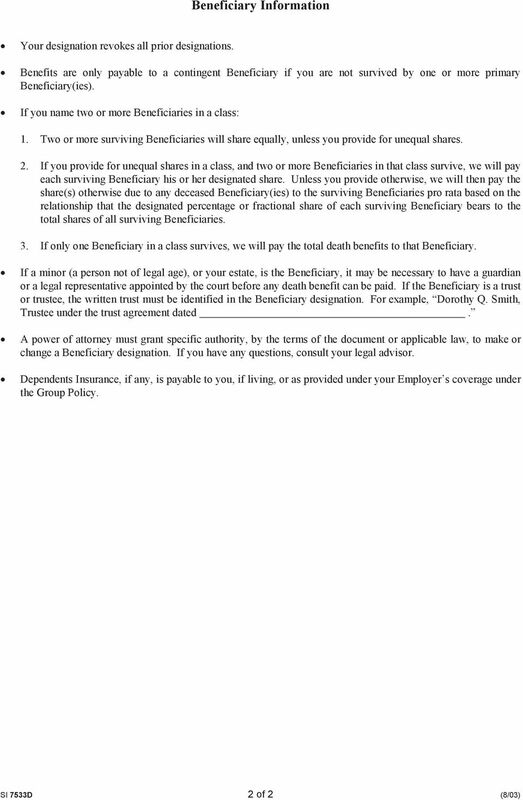 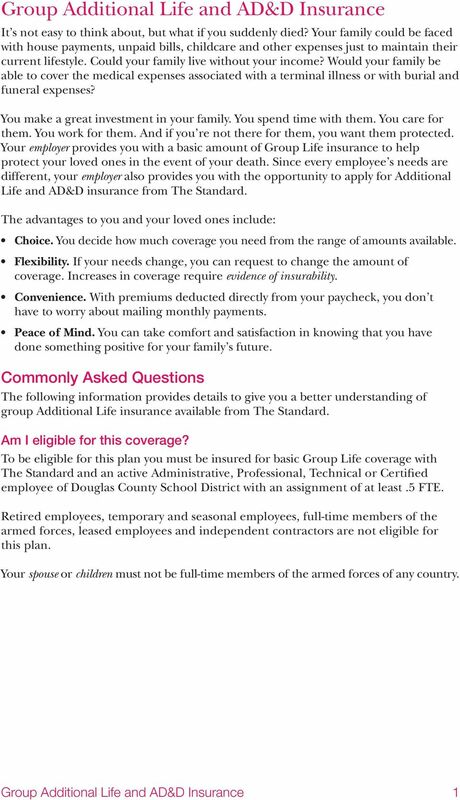 Download "Group Additional Life and Accidental Death and Dismemberment (AD&D) Insurance FOR EMPLOYEES OF DOUGLAS COUNTY SCHOOL DISTRICT"
2 About This Booklet This booklet is designed to answer some common questions about the group Additional Life and AD&D insurance coverage being offered by your employer to eligible employees. 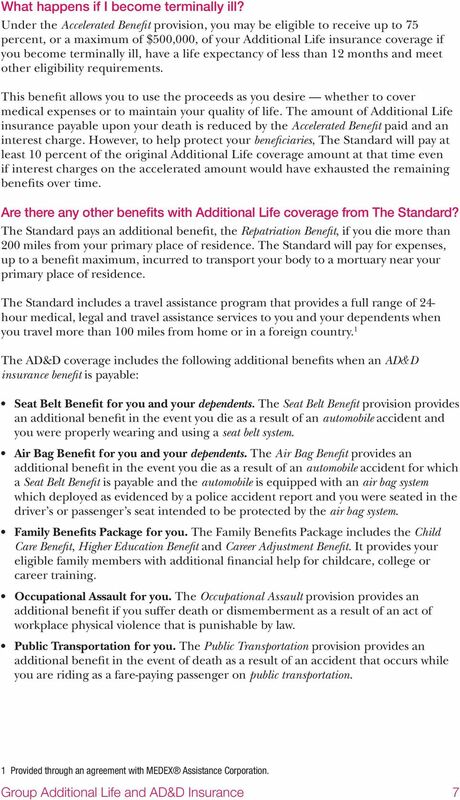 It is not intended to provide a detailed description of the coverage. 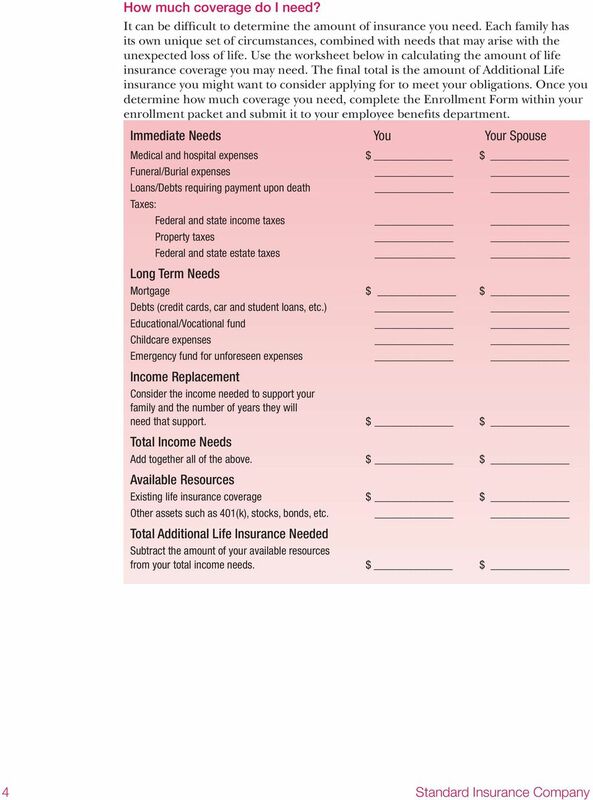 If coverage becomes effective and you become insured, you will receive a group insurance certificate containing a detailed description of the insurance coverage including the definitions, exclusions, limitations, reductions and terminating events. 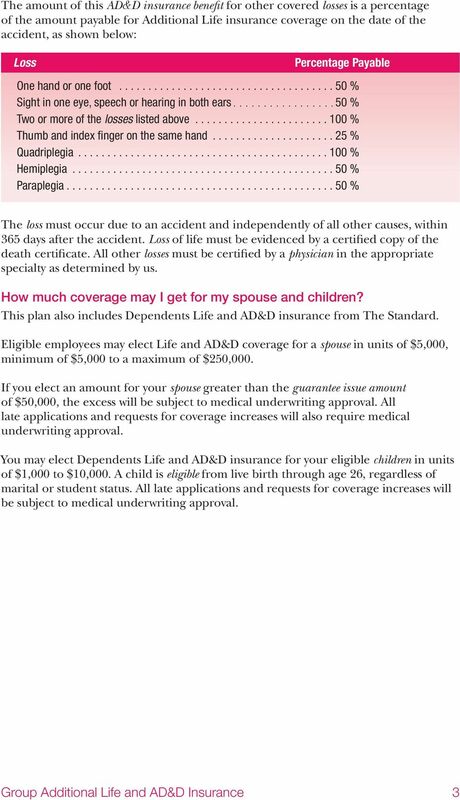 The controlling provisions will be in the group policy issued by Standard Insurance Company. 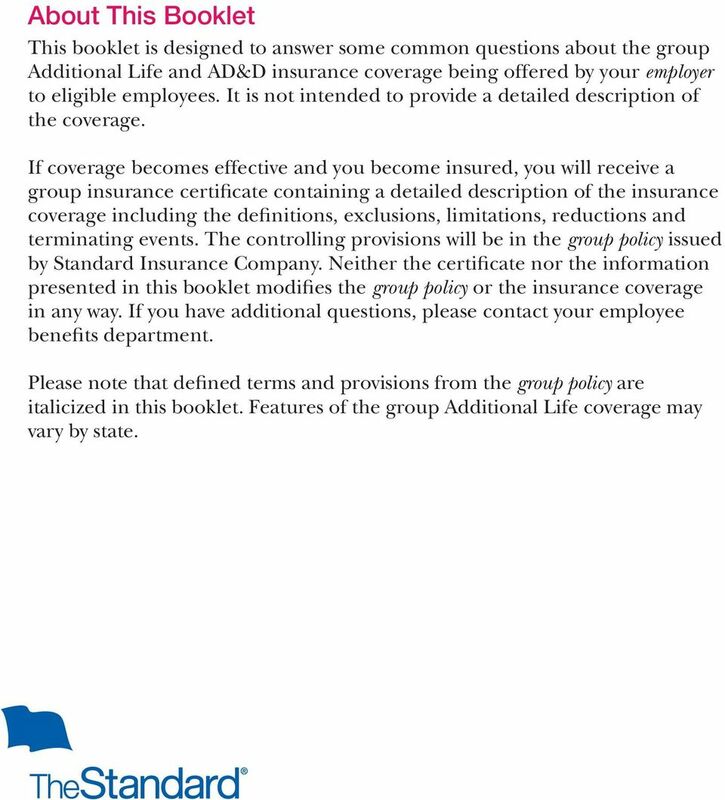 Neither the certificate nor the information presented in this booklet modifies the group policy or the insurance coverage in any way. 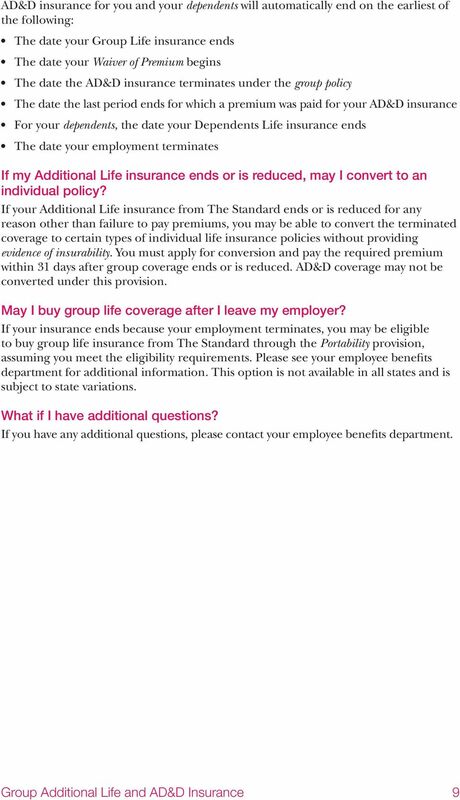 If you have additional questions, please contact your employee benefits department. 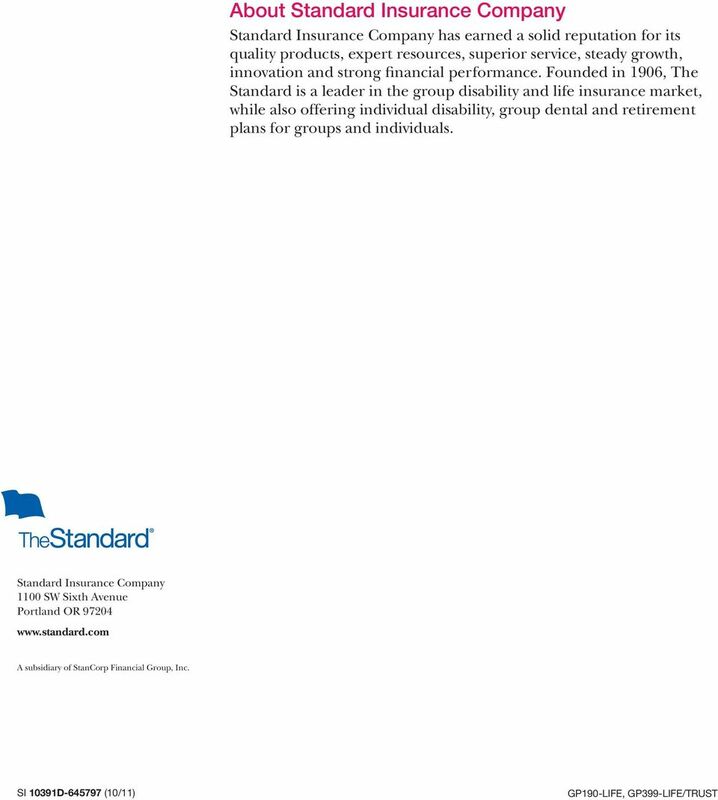 Please note that defined terms and provisions from the group policy are italicized in this booklet. 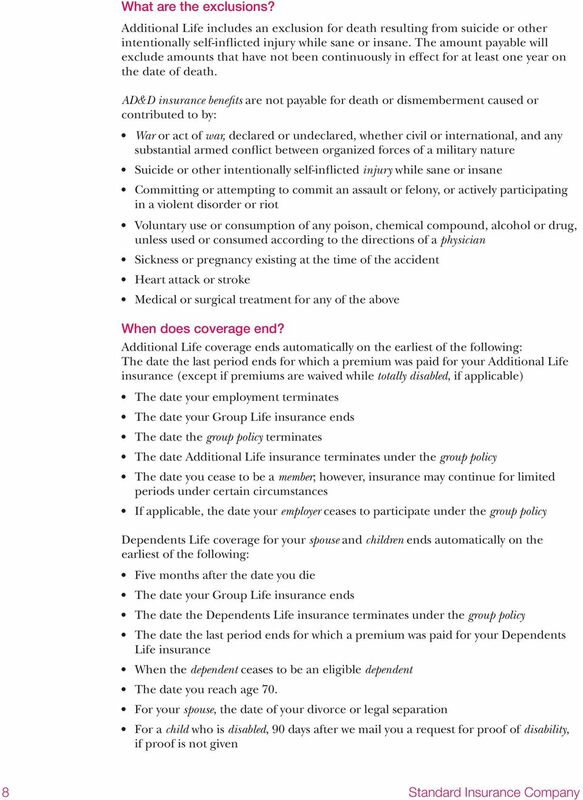 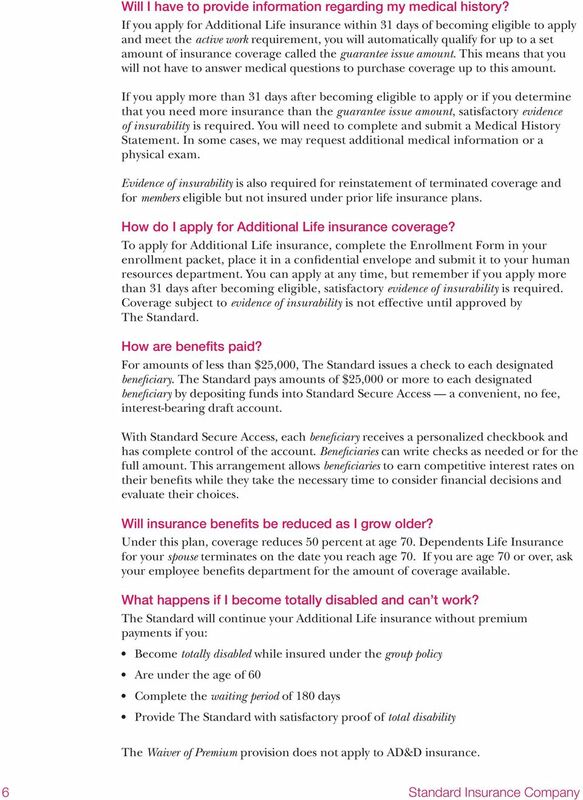 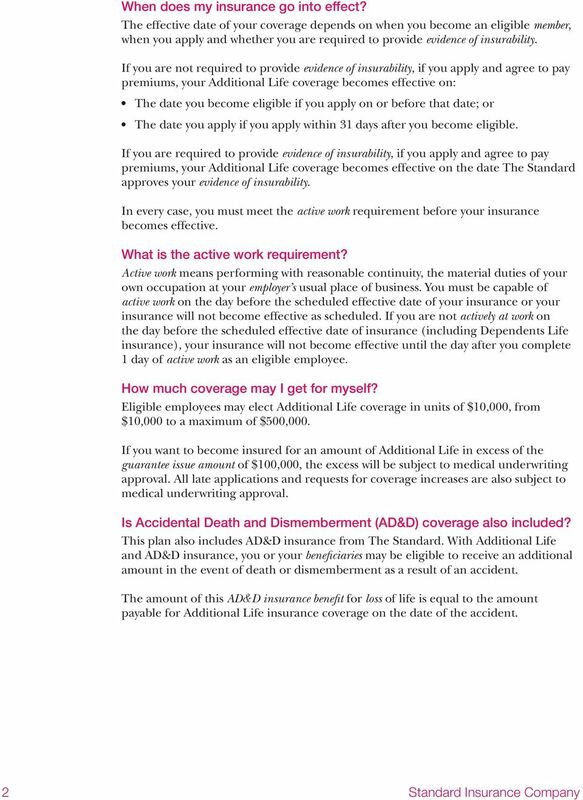 Features of the group Additional Life coverage may vary by state. 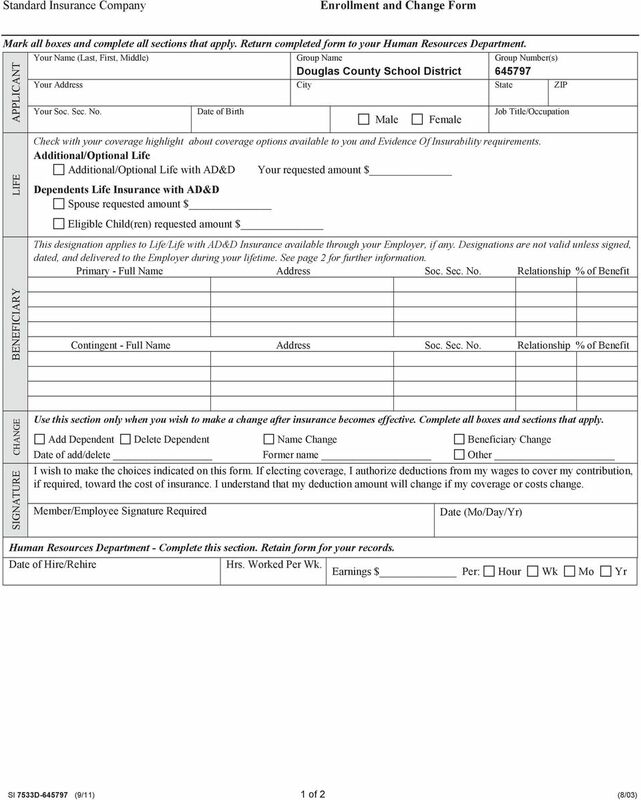 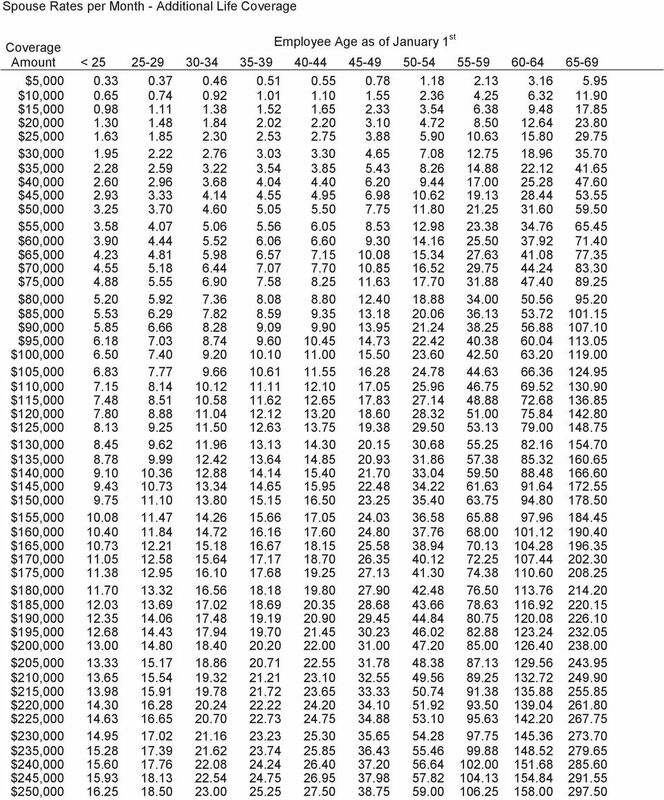 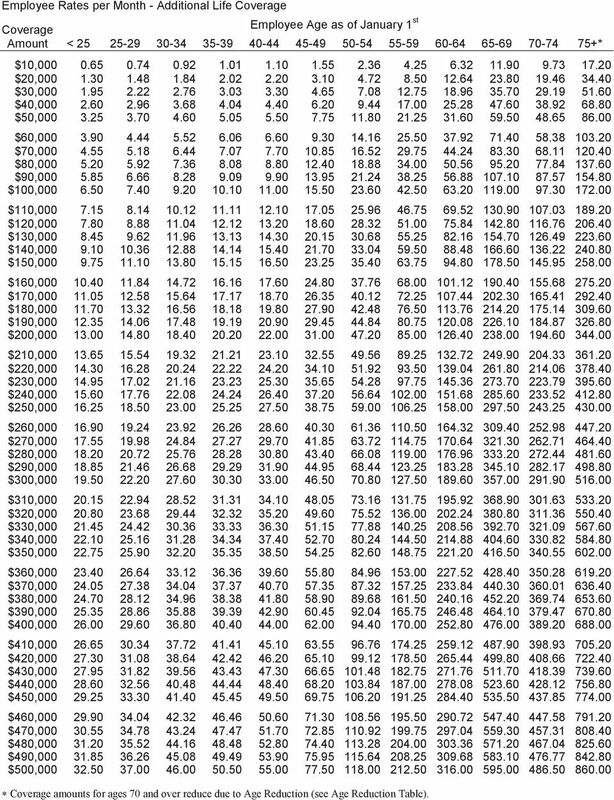 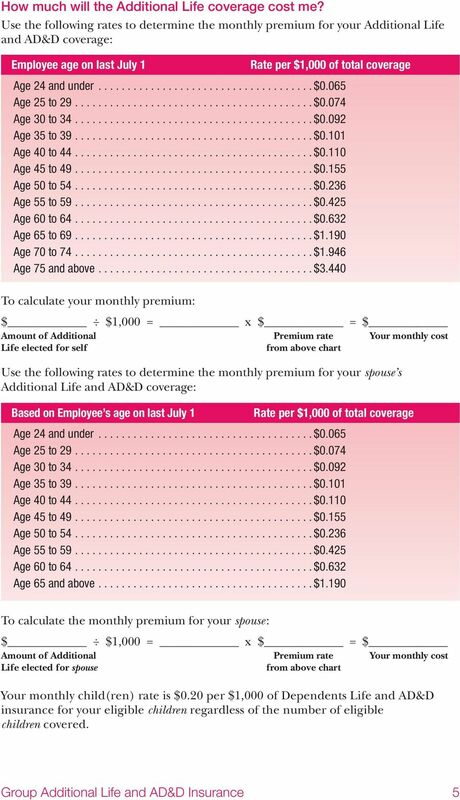 12 Employee Rates per Month - Additional Life Coverage Coverage Employee Age as of January 1 st Amount < * $10, $20, $30, $40, $50, $60, $70, $80, $90, $100, $110, $120, $130, $140, $150, $160, $170, $180, $190, $200, $210, $220, $230, $240, $250, $260, $270, $280, $290, $300, $310, $320, $330, $340, $350, $360, $370, $380, $390, $400, $410, $420, $430, $440, $450, $460, $470, $480, $490, $500, Coverage amounts for ages 70 and over reduce due to Age Reduction (see Age Reduction Table).